Bronchoscopy ─ one of the modern methods to diagnose diseases of the pulmonary system. 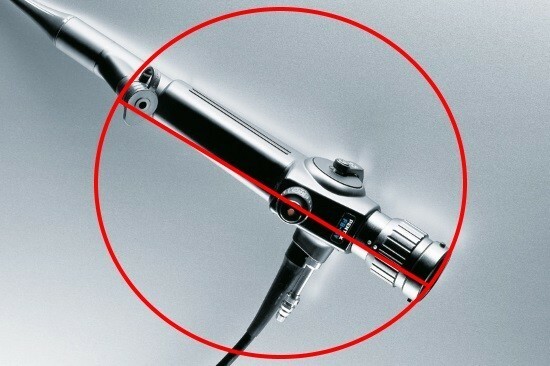 The procedure is performed using a special tool ─ bronchoscope which is a flexible tube with a camera on the end. The bronchoscope is introduced into the respiratory tract a little patient and the doctor is able to evaluate the breathing passages with your own eyes, as the camera of the bronchoscope is displayed. In this article we will talk about how is bronchoscopy in children. There is disagreement in medical circles about whether to perform a bronchoscopy to children suffering from bronchial asthma or not. Only this method can help to diagnose asthma in the very early stages and begin treatment. In addition, in this pathology it is possible to conduct bronchoscopy to restore pulmonary ventilation, that is, with the purpose of treatment. There is also a need in the survey with resistance to therapy. Before bronchoscopy, the patient needs to conduct a survey, including complete blood count, urinalysis, determination of blood group and RH factor, chest x-ray in two projections, if necessary, the ECG and the spirograph. More about that and what to do during the examination. The procedure is performed on an empty stomach, several hours before the test you need to stop drinking even water (all these measures in order to prevent the ingress of food and liquids into respiratory tract), eve may be administered sedative drugs. 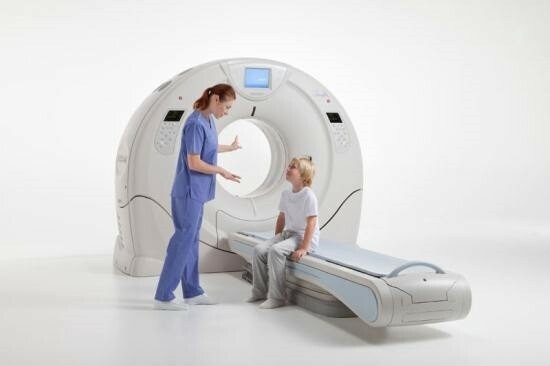 They have a much more complicated procedure than in adults, and requires more training and skill from the doctor. Bronchoscopes that are used in this case have a smaller diameter and are selected depending on the age of the child. In children, the study of the bronchi often goes under General anesthesia. 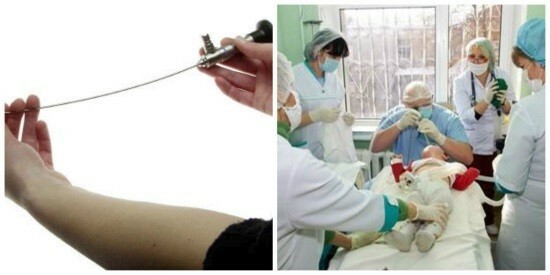 After the introduction of anaesthesia produced local anesthesia (usually with the use of lidocaine spray), and the doctor inserts a bronchoscope into the airway under direct vision with viewing of the passable region. The doctor conducts all the necessary manipulations (examination, collection of material for biopsy, removal of foreign body, bronchial tree sanitation, etc.). After that, the endoscope is removed, and the child removed from the anesthesia. In the process of research and the advancement of the bronchoscope in the airway, the doctor studies the anatomical structure of the bronchial tree, identifying possible deviations. In addition, the doctor evaluates the condition of the mucous membrane, its presence of edema, infiltration, bleeding, tumors. The presence of bronchial secretion, its quantity and character. All seen recorded in the study Protocol, interpretirovat the results of the study physician. After conducting bronchoscopy in children for some time can keep a sense of numbness in the throat, nasal congestion, feeling «coma» in the throat, the subjective feeling of difficulty of swallowing saliva. The body is a hotbed of active inflammation. For example, if the child has a runny nose, fever, all signs of current acute respiratory infection, better to wait for recovery and then do a bronchoscopy. However, these recommendations are not absolute, in some cases, research is necessary to spend immediately, the final decision is made by the attending doctor. The child is in serious General condition, he had decompensation of somatic pathology. There are disorders of blood clotting. In this case, increases the risk of developing trudnootdelyaemoy pulmonary hemorrhage. The aggravation of the infectious process in contact with the infectious agent in the lungs. Damage to the bronchial wall. Bleeding from the pulmonary vessels (maybe as in taking material for research, and the promotion of bronchoscope). Bronchoscopy ─ one of the most modern techniques, allowing to carry out not only a diagnostic but also a therapeutic event. It is unique, fully able to replace it. As a method of imaging lung physicians also use computed tomography. Most often imaging is assigned, at the beginning of the diagnostic search, to see what areas of the body you should pay attention during bronchoscopy, in which localization is to take a biopsy. Doctors are actively using bronchoscopy as an effective and reliable method for the diagnosis and treatment of pulmonary pathologies. Often, it becomes an indispensable method, which allows to make a differential diagnosis between similar diseases and to decide on treatment strategy. It should be remembered that the doctor schedule the bronchoscopy the child strictly when indicated. Only when she can not do without. Do not be afraid, we must trust in the professionalism of medical staff. If concerned about disturbing thoughts, it is better to share them with your doctor baby. He tells in detail why there was the need for passing such a procedure, how to prepare, how it will be conducted. Usually if the anxiety of the parents decreases, and they’re more relaxed approach to the examination of the child. Bronchoscopy lung: what is it and why do it?